That is not the quality of food that one would expect from a restaurant of your level and reputation. You need to make sure that your customers are getting the highest caliber of available ingredients as well as proper preparation. I trust that this is not the type of letters that you wish to receive from your customers and I also trust that you are going to deal with this complaint in a strict manner while taking all the necessary measures to make sure that such incidents do not happen again. You may contact me at [xxxxxxx] if you want to ask me questions about the incident. 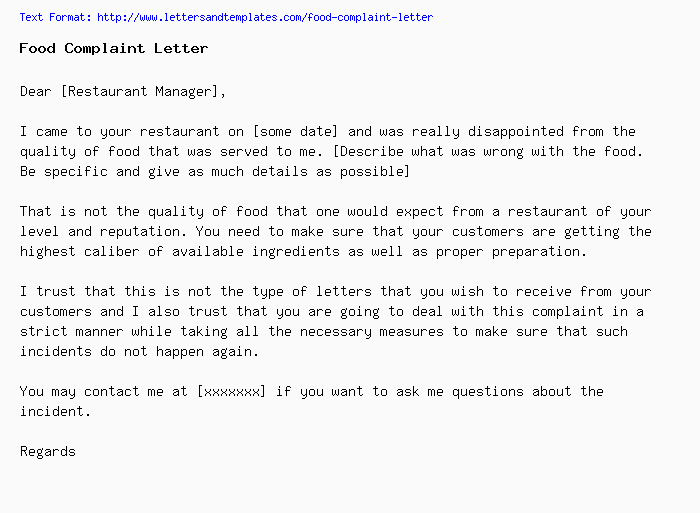 I am writing this letter to file a complaint about the food that was served to me in your restaurant on [some date]. I am sorry to inform you that your food was unsatisfactory at so many levels. [Your complaint goes here. Describe what's wrong with the food]. I don't know if it's normal for you to receive complaint letters from your clients, but it's certainly not normal for me to consume low quality food especially when costs me a good chunk of money. This incident needs to be investigated and necessary precautions must be taken to ensure the safety and satisfaction of your customers. Normally I would take this directly to the Consumer Rights Department, but I have had some good meals before in your place and can only hope that this was a onetime thing. I can be reached on [xxxxxxxxxxx] in case you want clarify the situation to me.